On Tuesday, December 20th, we will release build 1108. This is our first Steam-only release, and we would like to remind you of our offer to migrate to Steam for free, which will be extended until January 31st, 2017. To reiterate where we are, we are making really good progress with a new development team coupled with a new vision. As long time sim racers, we understand the need for a strong platform with great content, physics and visuals as well as competition, both online and offline. A detailed changelog will be posted alongside the actual release, but some of the highlights of this build include a huge update to our Stock Car rules, better support for running Steam in offline mode – which can be very useful in LAN situations and a fix for the nVidia driver bug that has been plaguing some users of certain series of nVidia cards. Good news! We’re ahead of our DX11 development schedule and are internally testing the first builds now. There is still a lot to do in terms of adding new features such as depth of field and motion blur effects on external cameras as well as overall improvements such as the shadow system. Needless to say, the results so far are looking good. We are really excited about the capability we have already and where it’s going. Our goal to keep the engine backward compatible seems achievable, and in the upcoming months we will start engaging the modding community providing information on the improved engine and how best to utilise it. As we’ve announced last month, we are completely revamping the user interface of rFactor 2 to make it easier to use, nicer to look at and ready for VR. We’re leveraging modern web technology and are currently in the middle of the design phase. 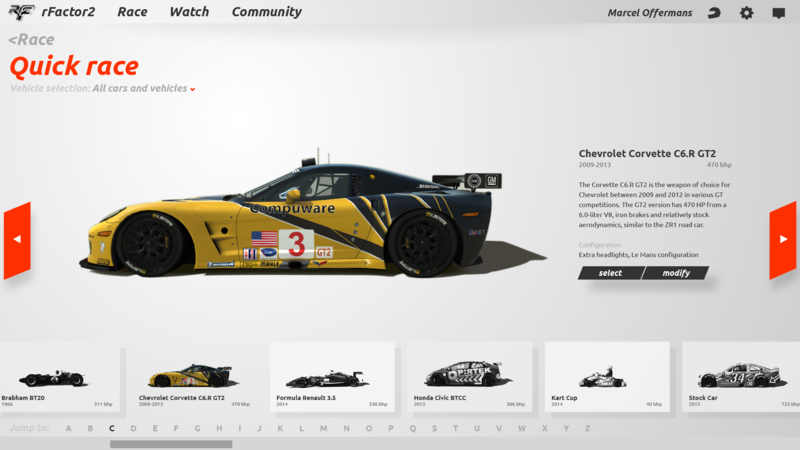 To give you a first impression, we’ve added a screenshot of a WIP car selection screen. Concerning content, we are very excited with the direction we are headed, certainly in the way plan to match cars and tracks. We will start to develop this approach over the next few months. We have a number of car developments underway. With our current focus on the Radical, we are adding the finishing touches to the 3D model right now while we wait for some additional data to complete the physics model. More great news! We have just signed a license with General Motors for the 2016 model of the Corvette C7.R. Development of the model ans physics will start early next year. The 2016 model has significant aerodynamic improvements with a new, larger splitter and a large diffuser to generate more downforce. 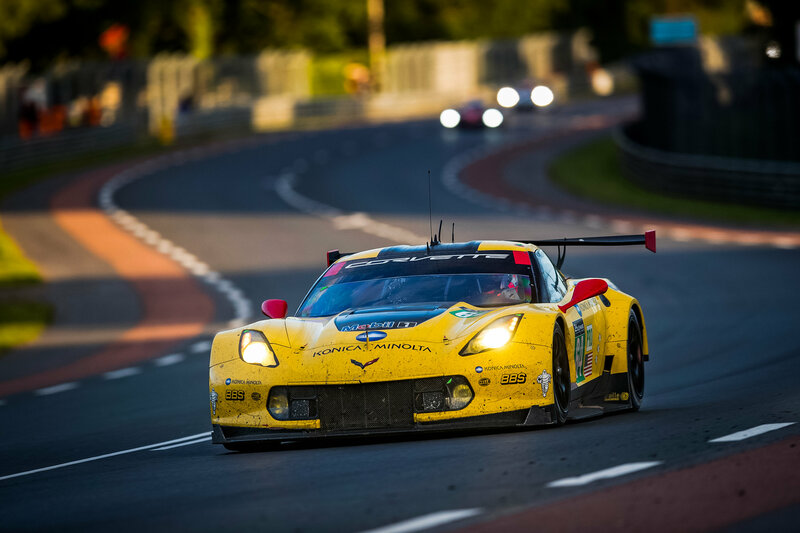 The car is the weapon of choice for Corvette Racing in their 2017 IMSA campaign as well as their effort to win the 24 Hours of Le Mans. As an added bonus, this car will also contribute to improving car physics overall. 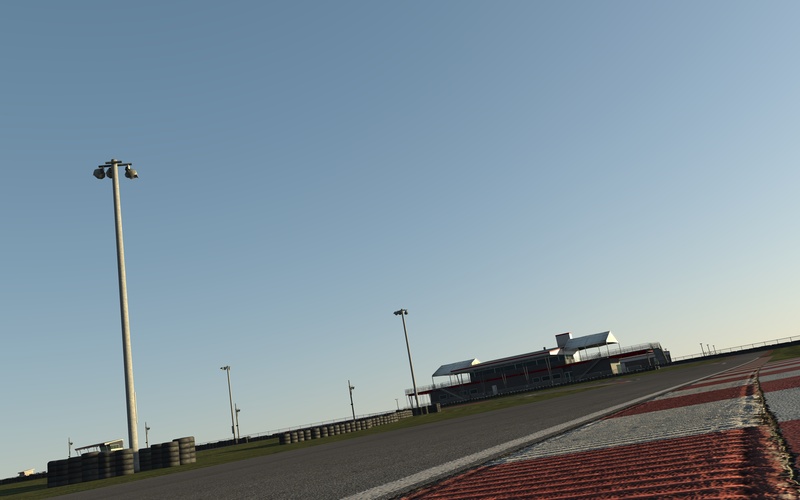 In terms of tracks, we’ve already shown you previews of NOLA Motorsports Park in earlier updates, and we’re now in the final stages of development. The track will feature 5 different road course layouts and 5 different karting layouts, and we’re currently placing track side objects, such as grand stands, trees and a ferris wheel and are working on AI paths. It’s looking good for release early next year. Now let’s talk about online. Since the release of rFactor 2 the pricing consisted of a one time payment and an online subscription, with the option of buying a lifetime version of that subscription. Over the years we have received a lot of questions about charging extra for online access, and what people were getting for this in return. We understand that online racing is key to the future of the platform. As online racers ourselves, we have decided to provide online access for everybody with the Steam version for free – simplifying the pricing model and encouraging everybody to race online. Steam will take care of automated updates. We recognise that some of you have made this purchase over the past few months, and it was a difficult decision. However, we’re positive that you’ll agree we’ve made the right decision for the future of the platform. With the Steam Winter Sale approaching what better way for you to relax and driver rFactor 2. Look out for an exclusive offer for the holiday period! That’s all for our last monthly update of 2016. Happy Simracing and have a great holiday. We hope to see you all in the new year!